Wen-fai Fong utilizes observations across the electromagnetic spectrum to study explosive transients and their host galaxy environments. These transients include gamma-ray bursts, electromagnetic counterparts to gravitational wave sources, compact object binaries, supernovae, and anything that collides or explodes. The main questions she seeks to answer in her research are: What are the energy sources powering these transients? What is the nature and composition of material ejected from these sources? What types of environments do they explode into? What do their host galaxies look like, and what can they tell us about their progenitors? To aid these efforts, Wen-fai uses a large variety of telescopes spanning radio, optical, near-infrared, and X-ray wavelengths on the ground and in space. On the ground, these facilities include the Very Large Array, Magellan, Gemini, MMT and Keck located in New Mexico, Chile, Hawaii and Arizona. In space, she uses NASA's Swift satellite, the Hubble Space Telescope, and eventually the James Webb Space Telescope when it launches in late 2018. She also uses information from the Advanced Laser Interferometry Gravitational-wave Observatory (LIGO) to rapidly follow gravitational wave sources and their host galaxies with many of these facilities. 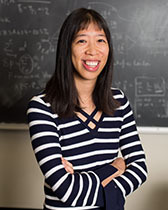 Over the past several years, she has led multi-wavelength observational campaigns, garnering national recognition for her studies of short gamma-ray bursts.